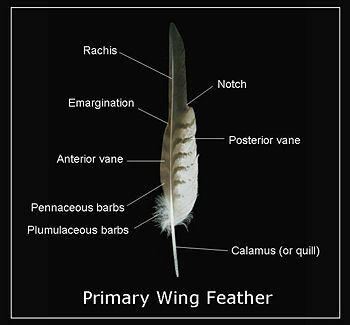 A feather is any one of the protruding flat soft growths making up the total plumage of a bird. Feathers degrade over time because of sunlight and bumps with physical objects. Few feathers last more than two years, and flight is less efficient with older feathers so birds must be constantly replacing their feathers. Growing new feathers takes a lot of energy, and sometimes is spread over two years in a feather by feather exchange in larger birds, while, for smaller birds, feathers are replaced quickly (in 3 to 6 weeks) at other times than breeding seasons. Though feathers grow with barbs so they hook together into an aerodynamic system, small birds can fly with some gaps in their wings because their greatest power is much more than that needed for simple flying. Larger birds do not have this margin of effectiveness so they would not be able to fly if they lost too many feathers at once. Presumably small birds are less maneuverable and fly less high while they are molting. One study suggests that the main limit on size of birds is the time needed to replace feathers. The larger the bird, the larger the feather, and the longer it takes to mature completely. Flightless birds can grow larger because their feathers do not need to be so aerodynamically perfect. ↑ Which Came First, the Feather or the Bird? ( Preview ) A long-cherished view of how and why feathers evolved has now been overturned. By Richard O. Prum and Alan H. Brush, Scientific American, March 2003, Accessed 19 June 2010. This page was last modified on 14 February 2013, at 19:09.